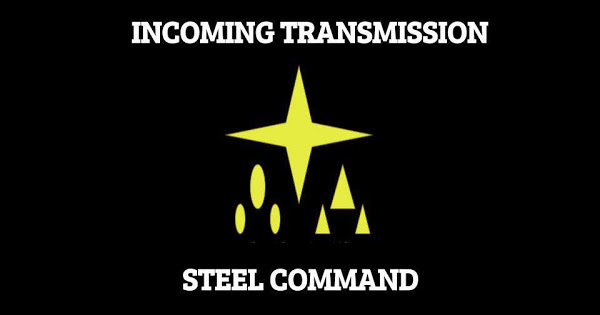 Time to talk about the "Corps" unit in the game. 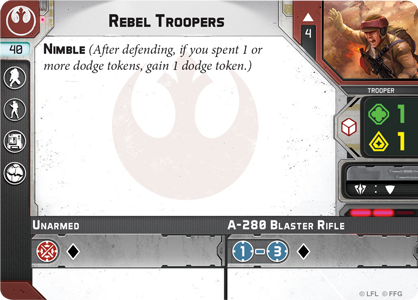 The Rebel Troopers from the Core Set and Rebel Troopers expansion are the first Corps type unit Rebel players will have access too, until the Fleet Troopers come out with Leia in "Wave 1". These units will form the backbone of your armies and be at the center of your victories - in fact 1/2 of all victory conditions specify "Troopers" (i.e. not vehicles), and the other half specify "Unit Leaders" (of which these are the cheapest to put on the table). Yes, I know I haven't talked about Vader yet. 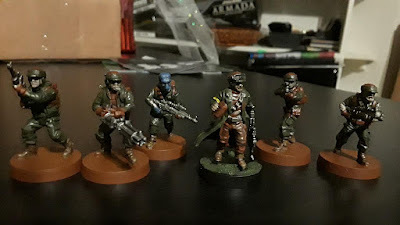 I'll be honest, I'm going to be a Rebel player, so I'll get around to talking about the Imperials when I can / my buddy paints his. Your Rebel Troopers come dirt cheap. 40 points gets a squad on the board, but not a very exciting one. 4 units in the squad, with Black dice for Ranged attacks gives them a 93% chance to suppress anything they are firing at, but without any natural surges on offense, they're stuck doing just 2.0 damage per attack average before defenses kick in. Defensively, they're white defense die, with a defensive surge, giving them a 1/3 chance to cancel each hit. Only 1 courage means they are suppressed if you look at them funny, and will panic quickly if their commander isn't nearby and they are taking any kind of fire. Their best feature is the Nimble trait. Dodge with them once, and you'll have a dodge token for the remainder of the turn. This makes them very good for handling a smaller dice pool attack... at least "better" as they get suppressed and panicked easily. Mobility-wise they are middle of the road, with a move of 2. What turns Corps units from "cheap fodder" to good though is that they have the potential to turn from inexpensive infantry to infantry supporting a heavy weapon. By adding a heavy weapon to your squad, you not only improve your firepower, but you gain the chance to fire on multiple targets during your attack, potentially suppressing multiple enemy units. In addition to heavy weapons, you can choose to keep your troopers as "cheap fodder" infantry, but add more models to the unit, or add grenades to give yourself that second attack at close quarters. There are also some gear upgrades they can take. 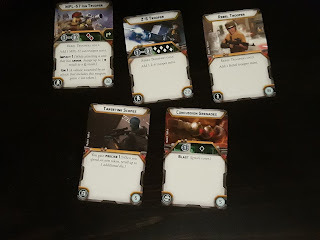 How you want to kit your troopers out may determine how you acquire them, as all the upgrades you can use are not included depending on where you get you troopers. Rebel Trooper - 10 points - A simple upgrade, you just take an extra Rebel Trooper mini and add it to your squad, giving you 5 troopers instead of 4. This is exactly the same cost as dividing the 40 point cost of the base unit by the 4 minis already in it. A good value for keeping the unit on the board longer. Almost a no-brainer if you're taking a Heavy Weapon upgrade - remember you choose which mini is removed as you take damage, so the Heavy Weapon mini should be the last one to go before the unit leader. Z-6 Trooper - 22 points - The first "Heavy Weapons" upgrade, the Z-6 gives you a Gatling gun looking laser, that spits out 6 white attack dice from Range 1-3. This gives you an excellent platform for putting suppression onto an additional enemy unit. You won't do a lot of average damage - just 1.5 on average before defenses - but an 82% chance of rolling at least one hit. By splitting your fire between the trooper minis and the Z-6 mini, you can attack 2 units a turn, and have a pretty decent chance of suppressing both. MPL-57 Ion Trooper - 32 points - This is a bit more pricey for a "Heavy Weapons" upgrade - you're paying more than half the price again for an expanded squad (with the Rebel Trooper upgrade - 50 points) to bring this guy along. But for those points, you get 2 Red attack dice from Range 1-3. You also get Impact 1 and Ion 1 as keywords. If the Z-6 was about splitting your shots, the MPL-57 is about focusing fire on a vehicle. 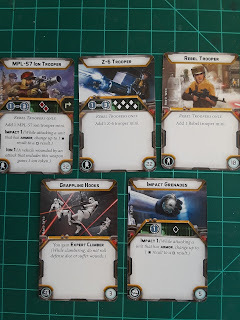 Normally, your blasters will be less useful against an Armored enemy - you'd need to roll a 1/8 chance critical result to even do a single point of damage. But you want all the chances you can get to proc the Ion 1 - which will lock down the vehicle, taking away one of its two actions! Suppresion for vehicles! One word of warning - in addition to the cost in terms of points, the MPL-57 weapon is also an Exhaust. Once you use it, you'll need to take a Recover action to get it back, which means you won't be able to fire it each turn at an enemy vehicle if you're suppressed. Targeting Scopes - 6 points - Precise 1 gives you an extra reroll when you spend an Aim token. This is arguably best with the Z-6 Trooper who will have a ton of blank results he'll need to reroll anyway, but could also be used with the MPL-57 Ion Trooper to give you some additional chance to roll that 1/8th critical chance. It probably isn't best as an upgrade on a generic 4 trooper squad - 4 Black dice only average 2 misses anyway - but 5 troopers might almost make it worth the investment. Grappling Hooks - 3 points - Expert Climber isn't anything to write home about, unless you're utilizing a lot of custom terrain. Leave this upgrade at home if you're playing on a featureless plane, but consider it if you aren't sure what you'll be seeing. Impact Grenades - 5 points - A chance to really mess up an Armored enemy if you get close. It is just Range 1, but it's also Impact 1 (per trooper using the grenade) so you can cause some considerable damage with this bad boy. Possibly some spectacular damage if you combine it with one or the other Heavy Weapon upgrade. Note: it is it's own weapon, so with this, a Heavy Weapon trooper, and the generic weapon, your squad could make 3 different attack pools on 3 different targets. Spread the suppression love around! Concussion Grenades - 5 points - Blast ignores cover, making this the anti-infantry alternative to Impact Grenades. Note: Blast is added to the pool just by using this weapon, so you can combine it with a Z-6 Trooper (and some luck!) to hose something down. 4 minis. That's it. It's cheap, it gives you an extra activation (if you want to go last with something), and it lets you contest objectives and force your opponents to react to something that you haven't spent a lot of your points on. "Hey look! A distraction!" 6 minis. The suppression experts. Always be firing at two different units. Your rifle fire is your "heavy" damage, while the Z-6 is there to keep something's head down. Use this unit to lock an area down from infantry. 5 minis. The poor man's Z-6 Trooper unit. Charge at an objective, and toss grenades at your enemies when you get close. 6 minis. This is one expensive unit of troopers, but they'll hit any vehicle they come across like a sack of bricks. Between the MPL-57 and it's Ion 1 and the Impact added from each grenade, you can cripple an AT-ST dumb enough to get too close. It's going to be a target though, for any enemy savvy enough to see what it is capable of. - Don't forget to Prime your models! I used a light grey. - Clothing & Equipment - Mournfang Brown and Castellan Green. Green goes on first, and then when dry you can go over your sloppiness for the Brown bits. - Skin - Rakarth Flesh (Humans) and Macragge Blue + Rakarth Flesh (Duros). The Duros is kinda tricky, I mixed 2 parts of the Rakarth and 1 part of the Macragge to get the hue. - Guns - Leadbelcher. Seriously, that stuff looks really, really good for blasters. - Clothing, Equipment, Skin (Humans) - Agrax Earthshade. Look dirty! - Guns, Skin (Duros) - Nuln Oil. It's liquid skill! - Helpful to be able to tell your squads apart! I am painting a small arm band on each one, in a primary color. First squad is Gold squad. That should get you most of the way there. You can just drybrush the base coat back over top of the shade if you'd like, or get more technical. Remember, the models only need to look good to you! That's it for the Rebel Troopers! 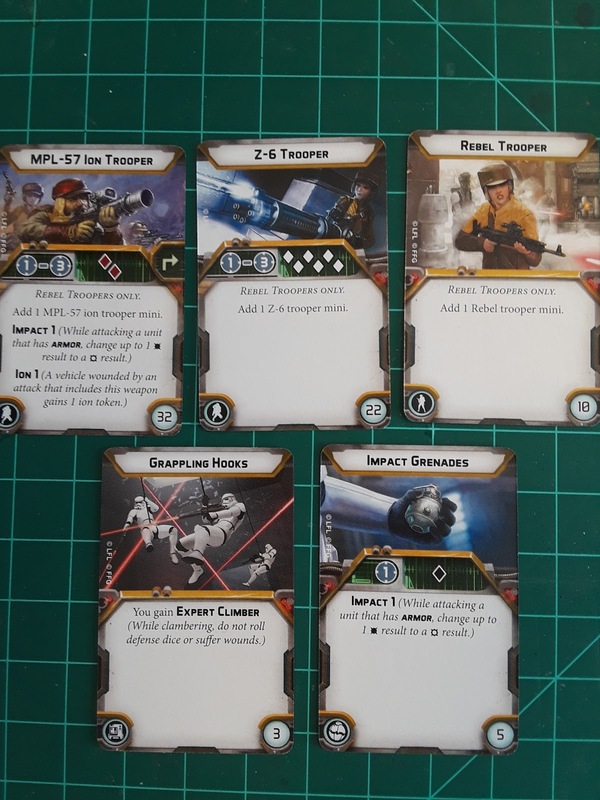 Hopefully this guide has you thinking of the best ways to use them in your next game. Good luck out there! The painting guide has surprised me for good! I follow your blog because of Armada, but I'm enjoying these Legion articles as well. Glad you're enjoying it! We'll be putting quite a bit more - making ourselves very busy. I'm going to have to try that skin color on my next Duros. 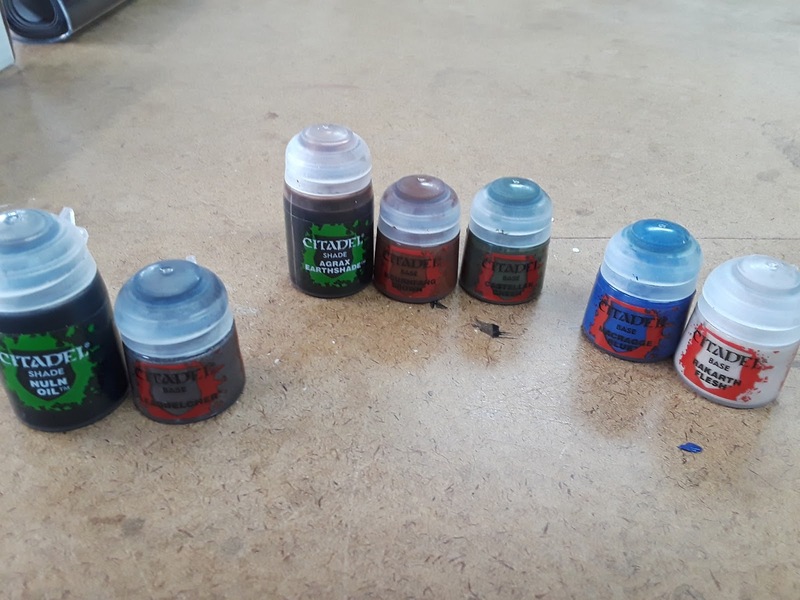 I've been doing The Fang/Nurgling Green and wet blending. Rebel Troops are fun to paint, but it's easy to get carried away with details. Don't forget that while the Ion Trooper is an exhaust to use their weapon, they can still use the standard trooper rifle as well if you don't want to waste a turn unexhausting the weapon. Good work on these articles--thanks for posting up your thoughts. isn't targeting scopes 6 points? Must have fat-fingered the 5 by mistake.